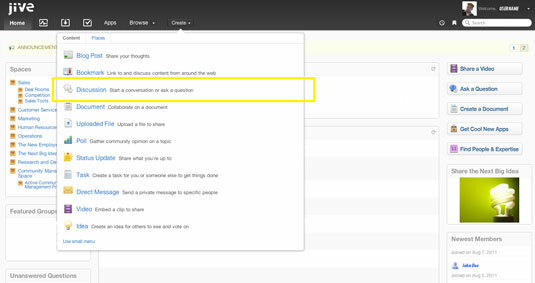 Creating, following, and posting within discussion threads is one of the most used features of Jive. Because Jive is designed with collaboration in mind, the ability to post a new discussion or follow an existing one is easier than ever. With previous versions of the software the Jive account administrator was the only person who could create and manage discussion threads. Since this feature became popular when Jive first rolled out, Jive developers implemented an update with version 5.0 that makes the creation and management of discussions available to all community members. Click on the Create tab in the top center of the Jive application. Choose Discussion in the drop-down list that appears. Under Post To:, select the community page where you want to post the discussion. Under Title, create a title pertaining to the content you intend to be included within the discussion thread. Select Mark this discussion as a question check box, if you want your discussion to be in a question and answer format. Type @username within the discussions dialog box if you want to relay information to someone directly. Keep in mind the person who posts the discussion is the only person besides the accounts administrator who can delete the discussion after it has been posted. To follow a discussion and post input, simply navigate to your community home page by clicking on the Home button in the top-right corner of the Jive application. Discussions will be posted right in the middle of the home page as well as polls, questions, files, comments, and status updates from all other community members. Simply locate the discussion you want to voice your opinion on and click the Reply box just below the posting. If the posting is in a regular discussion format, you then would read what everyone has to say and then type out and post your opinion on the matter at hand. If the posting is in a question and answer format, the person who created the post can give out reward points to the employee who provides the correct answer the quickest. Discussions are a way to keep everyone on the same page when new job-related knowledge needs to be distributed. Jive discussions also are a great way for all employee’s questions, opinions, and concerns to be heard by employers.